The tag line at Saddleback Leather Co. is, “They’ll fight over it when you’re dead.” Their full-grain leather products are, in fact, covered by a 100-Year Warranty. There are other leather covers on the market for a 5″ x 8.25″ Moleskine, like this one from ColsenKeane. That one is intended for the softcover Cahier notebooks. For the hardcover Moleskine–known for, among other things, its elastic closure–Saddleback has its own Moleskine Cover. The cover comes in small (for 3.5″ x 5.5″ Moleskines) and medium (fitting the 5″ x 8.25″ hardcover Moleskine). It’s made of full-grain leather. The stitching, as with other Saddleback products, is precise and clean. The leather is thick, consistenly a quality of Saddleback’s leather as compared to that of other companies. The quality is unflinching, but the leather cover feels a little too stiff for my tastes, even after some time of breaking it in. The curved finish on the back is to allow you to use the elastic to still close everything up. 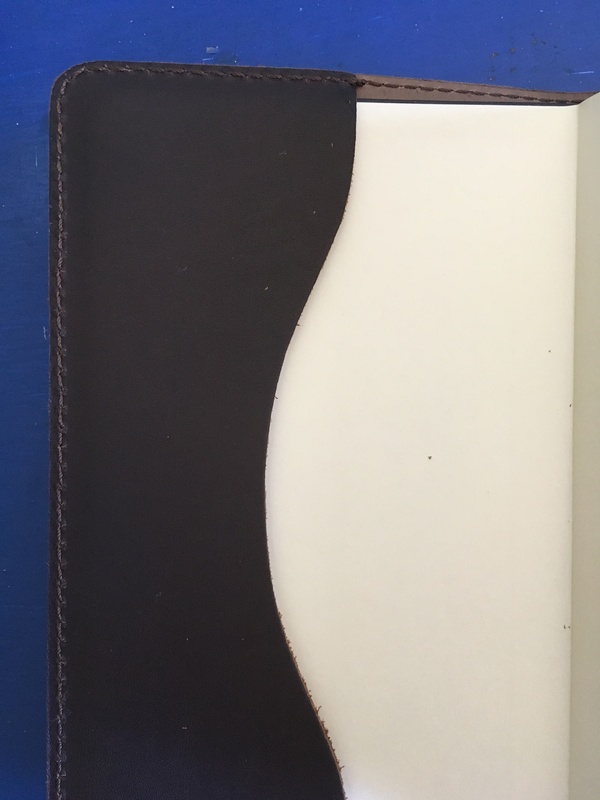 This stretches out the elastic, making it less than ideal if you were going to remove the Moleskine and use it on its own again, but chances are, once you put it in the cover, you’ll leave it there till you are ready to put in a new notebook. Dave at Saddleback shows how to use the elastic with the cover to make a couple different spots to put the pen. Being able to secure the pen to the notebook cover is a plus. The curved back, however, just looks odd to me. I get its functionality–I’m not sure how else you would allow the built-in Moleskine elastic to still be used with an external cover. But I like better the look of the Moleskine Bible cover, where the back of the book is totally covered and not at all exposed. 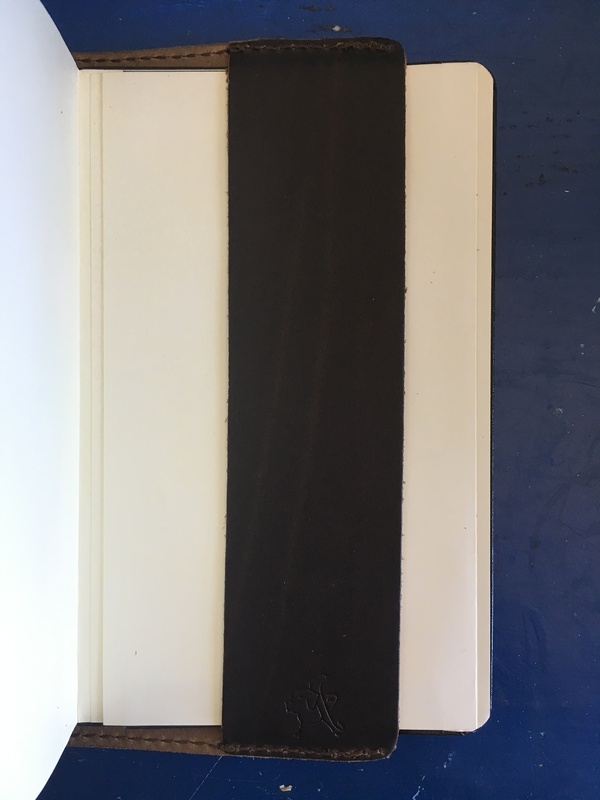 Besides, I’ve never really been a fan of the Moleskine elastic–it’s kind of cheap and may not last as long as it takes to fill up a given notebook. You may find other notebooks to use in this cover, but it is definitely designed with the Moleskine specifically in mind. Even the slighly bigger A5 notebooks are too big for this cover. It’s a tight fit getting the Moleskine in. I worried about bending the notebook when I had to jam it into place, but it did not bend and the fit is actually just right. And, as expected, the leather itself is beautiful and rich. The dimenions of the medium cover are 11.5″ x 9″ when opened and 5.5″ x 9″ when closed. It’s a light 0.4 pounds, so will add no bulk and lots of beauty to your daily notebook. Dark Coffee Brown is the color in the images above. You can find the notebook in that and other colors at Saddleback (here) or on Amazon (here). Saddleback kindly provided the cover for the review, without expectation as to the review’s content.